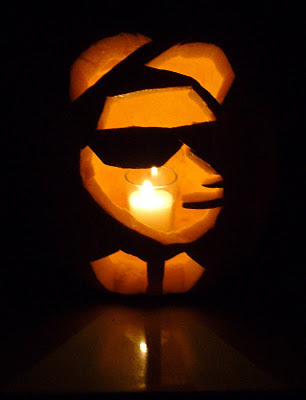 To put yourself in the mood (or to create one hell of a All Hallow's Eve party soundtrack), check out Hoi Polloi Skazine's prodigious list (300+) of ska/reggae Halloween-themed songs here. For what it's worth, several of my favorite ska Halloween tracks can be found on RiceRokit's Hang Loose album--"Dull Boy" is from Jack Nicholson's character's crazed and murderous point of view in Stanley Kubrick's movie version of Stephen King's "The Shining"; "Something Wicked" references Ray Bradbury's intensely creepy novel "Something Wicked this Way Comes," which is about an evil carnival that comes to town; and "Howl at the Moon" has the singer warning you to "run for your life" before he sinks his werewolf teeth into your neck (sample the tracks here). RiceRokit also recorded an incredible cover of Bauhaus' goth masterpiece "Bela Lugosi's Dead" that, unfortunately, I don't think will ever see the light of day (but really does deserve to be exhumed from its crypt). NYC Ska/Reggae PSA: King Hammond with The Hard Times this December! This is an important public service announcement (with guitar!) reminding all ska and skinhead reggae fans in the New York City area that the great King Hammond is coming over from London to play two shows in December--one in Manhattan/Harlem at The Shrine and the other at The Lake in Brooklyn/Bushwick. (I'll be at both!) He's going to be backed by the always incredible The Hard Times, so these promise to be mind-blowingly, booty-shakingly awesome gigs. These days, it's not too often that we have out-of-country ska musicians performing here in NYC (a shame, really), so make sure to mark these dates (below) on your calendar and come out to these shows! Do it! Duff Review: Black Market Sound System "Heavy Lies the Crown" b/w "Reggae Night" and "Movin' On"
Black Market Sound System--a group led by Sam Broke of Broke 'Til Thursday and comprised of punk musicians from various LA-area bands--is clearly inspired by The Clash's oftentimes muscular, but always spot-on and reverent and approach to reggae, as exemplified on the magnificent side two of the Black Market Clash EP (the perfect segue of "Bankrobber/Robber Dub," "Armagideon Time," and "Justice Tonight/Kick it Over"). Of course, punk rock and reggae have been forever bonded since the '77-era UK punks recognized that their defiant rejection of mainstream society was simpatico with the righteous determination to escape/destroy Babylon that fueled roots reggae. Clearly, both were rebel music. 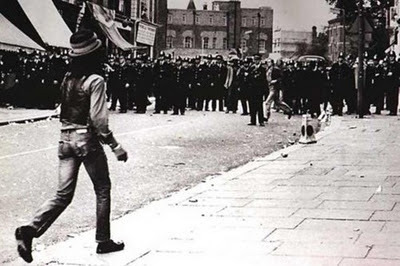 But there was also a familiarity and a solidarity of sorts between the white, working-class punks who had grown up side by side with the sons and daughters of the thousands of Jamaican immigrants who came to the UK (with their music and culture in tow) during the post-war years. Not only were both groups living in close proximity in the bleak tower blocks and council estates, they were ghettoized by--and alienated from--the larger, highly class-conscious and oftentimes racist British society that viewed both groups as outcasts (and formulated political policies against them accordingly). In the pop-culture narrative, punk/reggae DJ and filmmaker Don Letts is credited with introducing generation zero of punks to reggae, as he was the DJ at The Roxy, the first punk club in London. Since few punk records existed in '76-'77, out of necessity (and his love of Jamaican music) Letts often spun roots reggae and dub in between the live punk sets--which had a great impact on the scene. However, punk icons Johnny Rotten, Joe Strummer, and Paul Simonon were already been huge reggae fans and Don Letts has stated in interviews that oftentimes Joe, Paul, and John would often turn him on to reggae records that he was completely unaware of. The flip side contains their testament to their love of reggae music: "Doctor, doctor, tell me what's wrong/I spend all day and night singing these songs/Reggae music--can you hear the sound/coming through the stereos in your hometown?/Feels so good/Feels so right/Reggae night!" "Movin' On" is on optimistic song about cutting your losses (since "something's come between us") and being amenable to walking through a newly open door after another one closes: "Things get harder every day/So much fighting along the way/Too much pressure, that's why I say/That I'm moving on today." An inspiring song--that rocks out at the end!--to get you through these days of austerity and strife. To view the entire punk segment of this documentary, go here. Editor's note: Jason Lawless is the man behind the amazing new Reggae 69 Fan Club and its just-launched imprint Moondust Records. Modeled on music fan clubs from the 1970s, like the Trojan Appreciation Society, Reggae 69 Fan Club's mission is simple: "Release new music and help foster the sounds of '69 from today's modern bands." 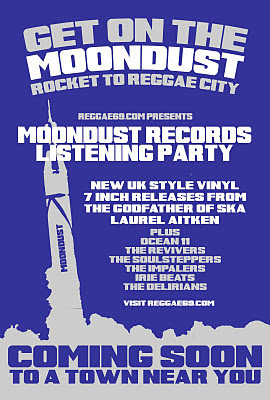 Everyone who loves ska and reggae and vinyl needs to know more about--and then join--this amazing club (samples of many of the Moondust Records releases are at the bottom of this post!). The Duff Guide to Ska: What initially inspired you to start the Reggae 69 Fan Club and Moondust Records? Why did you want to link the label to a club? Jason Lawless: Why is easy. I love vinyl. I'm a junkie for it. I'm a collector and a selecter, so I have to have things on vinyl, of course. Which is why I've always been trying to get things going in the right direction to launch a new label. I knew it was going to be vinyl-focused (with some CD/digital at some point too) and with the right push behind it. There are plenty of “labels” out there, but are they doing things for the fans or for themselves? Everyone needs to make money of course, but I hope to be able to do some really interesting projects/ releases and not just because the band needs a CD out. There needs to be some passion behind it--a reason for it to be put out. I got to thinking that there needed to be something that made fans want to participate more, too--sort of like back in the day with the Madness Information Service or Trojan Appreciation Society (which has now relaunched, too!). I really wanted to make that sort of exclusive and fan-driven aspect a big part of the new label. Back in the day, fan clubs were a big thing. You got special deals, exclusive releases, letters from bands, etc.--so that idea of making something special and exclusive appeals to me greatly. I think it can make for a really great package and promotion too. Especially in today's market. I envision the fan club being able to help market and distribute releases from other like-minded and musically-inclinded bands from around the globe too in the future--not just our releases, but a real collective of DJs, bands and labels working together to support the music. DGTS: The first two releases from Moondust are reissues from the great, late Laurel Aitken (Reggae 69 b/w Big Fight In Hell Stadium and Apollo 12 (Skinhead Invasion) b/w Moon Rock). How did you ever manage to get your hands on these amazing tracks? JL: Well, it was pretty easy actually. I licensed them from the label that is overseeing Laurel's catalog at the moment. Reached out to them and we worked out a deal. It went pretty smooth, in fact. The idea behind the whole thing really came out of my love for the work of Laurel Aitken. He was the first JA artist I started listening to via the old Moon Ska release and he is, after all, the Godfather. It worked out so well to come out swinging with some top tunes that fit perfectly into what I was trying to do, as well. It set the tone for what I hope to do in the future. It was just awesome to be able to do something with an artist I hold with such high respect. DGTS: Down the line, which other ska or early reggae artists would you really like to reissue on Moondust? JL: Oh man, so many. But the collector/ reissue market is very specific. I debated really issuing the Laurel Aitken tunes on my own label for instance. We all love the original labels deeply, right? I wanted to give people an instant idea of what I hope to do, so getting the Laurel tunes was a perfect way to do that. Trojan pretty much has a lock on so much of the original material, but as Rock A Shacka has proved, there are plenty more producers that are looking for outlets for their music. Should we have issued it on our own label instead of a true classic? Well, I felt strange really just taking an old label and reissuing a new release on it, especially if it was not a true repress (meaning tracks from different releases, but on the same label, for instance). I even asked the licensor what they thought about doing a New Beat release. They did not really say no, but that they didn't have the rights or anything for that art, so I decided that issuing it on the Moondust was the next best thing. I also knew I was not going after the reissue market as much as I am the new collectors and DJs. No one plays modern records really, but if I could make some new releases that looked and fit in with all the old ones, maybe they'd be more apt to play 'em out. The DJs are a big part of everything I plan to do. Being one myself--getting that group on board was key for me. They are the ones keeping the music alive, playing it at clubs, collecting, and promoting it. That is why we've set up parties across the nation with a lot of them that I know. Most have been very enthusiastic about it and spreading the word. So many times lately the fans have really been passed over by bands trying to get their music out. Sort of like bands saying, “well they don't have much choice, so they have to buy what I put out” and then dropping the ball on a lot of things that people do care about. This is a big part of why I think we're in such bad shape with modern band, really. So as far as orginal artists I can't say for sure, but Derrick Morgan and Dave Barker are high on my list since they are still active and more apt to do something. There are so many artists that I just don't have enough money to make deals with yet, but maybe one day. So going forward there are some new artists and releases already worked out --some more in the 70s style, rootsy stuff like more Irie Beats and Soulutionaries. I'm a big fan of the Rocksteady 7 stuff from David Hillyard too, so been talking to him about that and it's pretty much a go. Then more Delirians hopefully. 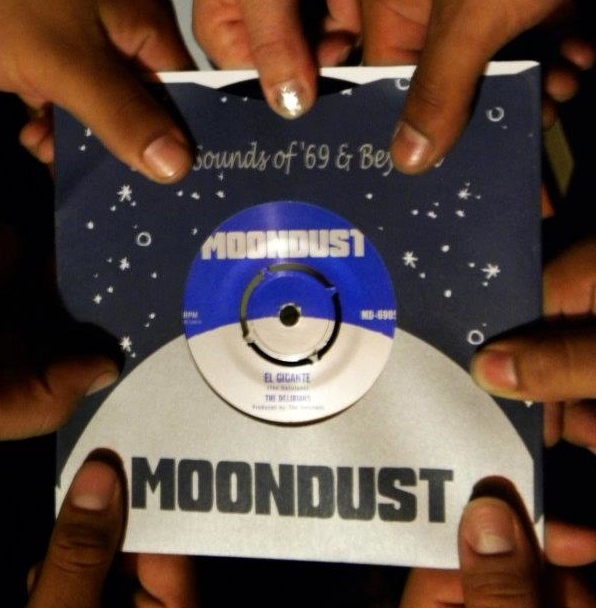 DGTS: All the Moondust singles feature a UK-style center punch (a brilliant detail! )—where did you find a record pressing plant that could still manufacture these? JL: There is only one and in the US, in fact! I've been working for a few years to get more material to release. But it never seemed right or the music just wasn't there. It was something I wanted to do for a long time. But as a few of my collector/ label friends and I always said, "man, it would be really tight if we could have those UK centers." It was like the thing we never thought we could do. We always want things to be as original and old school as possible. Many of them like Rhygin Records, Axe or Jandisc record only to tape (no digital) or do silkscreened sleeves-- that sort of stuff to make it more original. We all want it to be super tight and outta sight--clean and 60s as much as possible. So I'm always looking at deals for pressing plants. One day I found this ad for the pressing plant talking about UK style centers and I immediately said, "perfect!" After this and some other things that are coming up, I think they might start getting more business from it. DGTS: The Reggae 69 Fan Club was successfully launched as a Kickstarter project. With actual sales of recorded music increasingly limited to diehard music fans (since the vast majority of recorded music now acquired by the public is obtained through illegal file sharing), do you think that this is a viable model for indie labels and bands to utilize going forward? It seems like groups of dedicated fans will have to become investors in a recording project before it can be put into production and fully realized…. JL: I love KS! 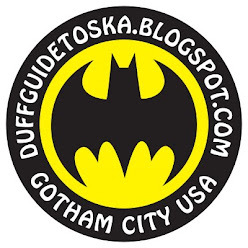 Been a fan for a long time--always looked at the site and the projects thinking, "wow, that's a really cool and fun way to connect with fans." So once I got some things lined-up, I dove into using it for my project. The first one failed by just a bit though, but I looked at it--figured out why and relaunched it to success. I think I'll be using that in the future. I've got some other ideas that I think will be fresh and fun, including new music, of course. DGTS: What are your plans for the label once the initial eight limited-edition singles are all released? Are you going to expand the label’s focus beyond (mostly) California early reggae bands? JL: More releases, for sure, as I mentioned! We already have two to four more in the planning stages. There is a punk label that releases a single a month every year --they pre-sell the year of releases and then go about doing it. That is the model that I would love to be able to do. Constantly releasing --there are still a lot of bands around the world keeping the flame alive, like The Granadians, Crabs Corporation, The Prizefighters, just to name a few. DGTS: To state the obvious, you’re a big fan of vinyl. When did you start collecting records; how big is your collection, and what are some of your most treasured records? JL: Not nearly enough--that will never end. Before I moved into my current place, I had a really small apartment. It was funny, because in the kitchen I didn't have dishes, I had records on the shelves! Now I have an extra room with shelves and more storage, so I've moved the records out of the kitchen. I started buying music in '94 in high school, and then over the last 16 years just kept collecting. I don't actually have a collection that some others have, like Nina Y Viktor (The Rocksteady Lounge) or Mark Morales (Hot Shot Sound System) or the SF Vintage Reggae Society guys-- these cats have been collecting a lot longer with more money than I.
DGTS: During the 80s and 90s, the SoCal/LA-area ska scene was massive—much bigger than NYC’s. What’s it like now? What are some of the bands that you’re following now? JL: Well, honestly there has been a massive drain over the last 5 years. Hepcat doesn't do much anymore and every other band has gotten older, had kids, etc. They still play every now and then, but the young bands have just disappeared in the traditional style. There are plenty of the Latin Ska crowd but that's not my scene too much. I think there isn't anyone for kids to look up to and idolize, so they don't go that way. For a while, there was a lot of good talent and they had something to emulate. Then the Bluebeat Lounge and Chris Murray came along, For a time there was something to look forward to each week. Some were good, some were bad, but it was there. I think that really created a black hole of sorts once it was gone. We've got some promising talent here and there again. I can't say it enough, but The Delirians are just so tight. The Revivers/Debonaires are still working it. The Expanders, if you want that 70s heavy roots, but we need some of the older acts to really show the kids how it's done again. Maybe Hepcat can hold a retreat or something. I kid, of course, but maybe not that much. Hepcat Camp where they teach some kids how to play or pass along their knowledge. Been trying to get a industry night together where we could have some of the people that have been around for a while talk about different aspects of the business and invite anyone that is in a band down. Still working on that. DGTS: The graphic artist Chema created a limited-edition print for Reggae 69 Fan Club members who pledged at a certain level. Why did you select him/how did this come about? JL: I've known Chema for many years now. Talked off and on and he would always ask me about doing art. I used to work for a large Latin music company that represents artists like Manu Chao and Los Fabulosos Cadillacs, so he was a big fan of those artists. I really liked his work and def wanted something special for the Kickstarter. Just worked out great with his piece. I want to do more. As a art collector myself--I have some Shag and Manu Chao pieces--I want to support artists, make what is happening a joint art and music thing. There are some amazing artists out there doing very ska-centric art, so why not bring them into the fold? Just like working with the DJs to make sure the artists join in the fun. It's all about being creative and fun for the fans. 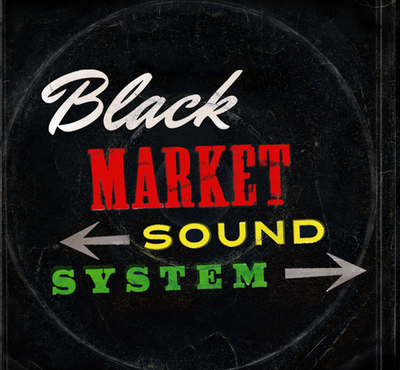 DGTS: Since these releases are all in limited-runs, are there spots still available for fans to join the Reggae 69 Fan Club, make their pledge of $45, and receive this series of singles? JL: Of course! We're doing launch parties around the nation during November and have a pre-sale going on 'till that time. You don't get everything that the KS supporters do, but you can get a really great deal on the first series. Just go to http://moondustrecords.bigcartel.com and you can see the packages available. Once that is over, the prices go up on each release. 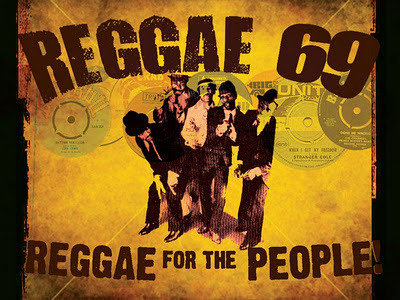 Then stop by our Facebook page at facebook.com/reggae69fanclub and say hello. Got some more surprises coming up, too. It's all really about showing the love for the music of a young Jamaica and for fans around the world. It's Reggae for the People! Thanks so much for chatting with me. 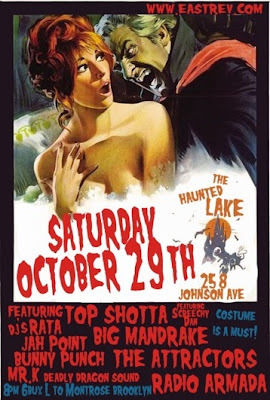 NYC Ska Gig Alert: Mr. T-Bone, Eastern Standard Time, Bigger Thomas, and The Rudie Crew This Saturday Nite! This bill of ska bands is strictly A-list, top-shelf, dynamite, primo, first-class, five-star, out-of-sight stellar--and all for the bargain price of $7! If you're not familiar with any one of the acts, check out their video below. Then, plan to get yourself onto the J train and to Goodbye Blue Monday on Saturday night! The Duff Guide to Ska: How did the Montreal Ska Festival first come into existence--and why was it established as a non-profit, all-volunteer organization? (I know the Canadian government is very good about supporting the arts; does the festival receive any government grants?) Have you been involved with it from the beginning, and what's your current role in the organization? Valerie Desnoyers: The Montreal Ska Festival started from a few fans who wanted to bring back the excitement and popularity that ska music once knew in Montreal. In the late 90s, Montreal was known as the ska capital of at least Canada, if not North America, and thanks to The Kingpins' and Planet Smashers' creation Stomp Records, we were world-reknown in terms of ska. That reputation and popularity soon waned, but the the talent remained. 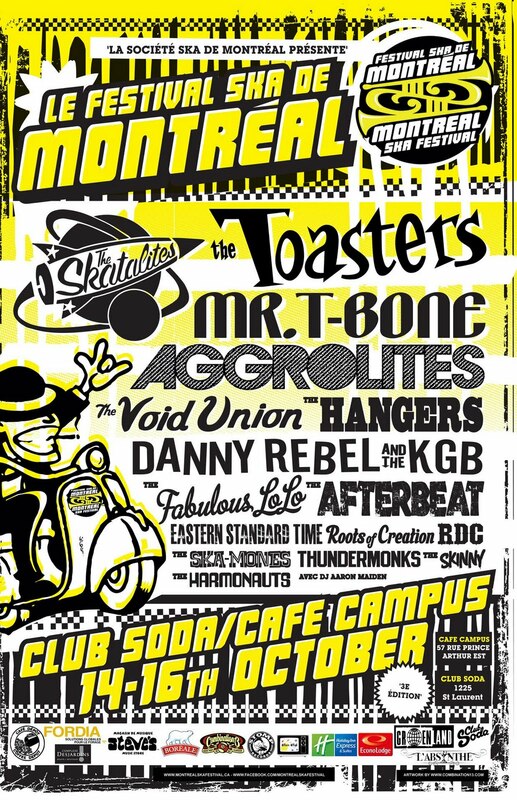 We thought it was a shame that Victoria, BC was able to have its own ska festival while Montreal did nothing. The Victoria Ska Festival is a well-known event that has now been running for 12 years! We were inspired by what they were doing and decided to stop waiting for it to happen and just make it happen ourselves. We sat down with Lorraine to run the idea by her and ask her for her input, and to learn from her experience and she pushed us into making it happen. She believed in us and supported us every step of the way, being our spokesperson, media coordinator, advisor--AND generously offering her musical support on every edition by playing with her fabulous band of all-stars ska musicians, The Fabulous Lolo. Therefore the project started in August 2008 and it was really important to us to make it non-profit so we could use all the money directly towards the festival and bands, without having everyone taking a cut before the artists get theirs. We feel the musicians are undervalued and that they deserve way more recognition (and money) for their hard work. People don't realize how hard it is to write, rehearse, book yourself, promote yourself, and deal with the paperwork on top of focusing on your music. We wanted to be a means of support and a offer a platform for the local bands so they could concentrate more on making music and developing contacts by playing with international acts. We are not receiving any grants, it is really hard for us because we insist on keeping the ticket prices as low as possible (less than $20 with taxes and service charges) to democratize the music and have people come and check it out even if they don't know the bands playing, but just because it's affordable. We have tried to apply for a bunch of grants, it's quite complicated and very time-consuming since you also need to produce a pile of paperwork for every application. We are DIY and have tried to get help with this but it continues to be a huge challenge. 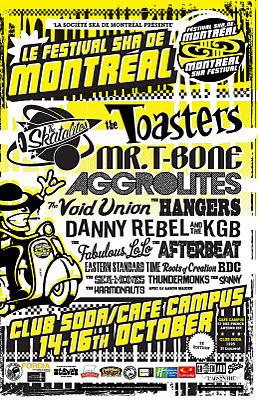 I was part of the originators of the Montreal Ska Society, I'm president and my role includes a broad variety of tasks, from artistic director to ordering the merch, dealing with the taxes and driving the backline. I have great volunteers helping me out, I could certainly not do it by myself. This year, more musicians have become volunteers and it's nice to see the scene being supported and taken over by the actual people that are on stage. Having them help out behind the scenes is refreshing and motivating for me. DGTS: For this year's festival, how were the bands selected? VD: We almost made it happen with The Skatalites for the 2010 edition, but they extended their stay in a South American festival, so the dates didn't coincide. Since they were interested and they are really a jewel for our crowd, we treated ourselves by making it happen this year! Lorraine Muller: I am not at all involved in programming, but what I'd like to add is that the true goal of the festival is to support and maintain a healthy ska scene in the city, so we/they really emphasize the local talent by selecting the cream of the crop for the festival. We avoid repeats from one year to the next, so this keeps the door open for new artists and provides them a concrete goal towards which they can work. After that, the headlining acts are picked based on Val and Cath's desire to share their discoveries with the city, as well as give people access to legendary bands that don't get to perform here very often. DGTS: Based your experience with previous Montreal Ska Festivals, how many fans are you expecting in total this year? VD: We are expecting about 2,000 guests altogether spread over all our events in the 2011 edition. We think The Skatalites are truly something special for the Montreal fans and we expect a lot of people to come this year that might not have been to the previous years. VD: Of course, The Skatalites are something really special and rare, but personally I'm really looking forward to see Mr. T-Bone (Italy) and Eastern Standard Time (Washington, DC). Mr. T-Bone will be playing on Canadian soil for the first time ever and EST, who haven't played here in over a decade, will not only be performing a set of their own but also serve as Mr. T-Bone's backing band. Void Union are a collective from Boston that we went to see last January to decide if they were MSF material and we were blown away! They are definitely a must-see in the 2011 edition. They are a 'coup-de-coeur' for me because a few members from Westbound Train are part of the project. WBT were one of the highlights of the 2009 edition of the MSF. Of course we are also psyched to see our local bands make their way in the line-up and play the big stage that is Club Soda. LM: The thing that excites me most about the festival is less the individual bands, and more the community that gravitates towards it. While I enjoy the performance of most of the bands, I really get my kicks out of seeing others enjoy the bands and discover something new! I've always said that to ME, and this is a very personal feeling, ska can be like a big hug. It reminds me of how I felt when i first discovered it, like someone was giving me a big hug and saying "welcome!" I'm very excited about The Skatalites coming to the festival, it makes me realize how far it has come in such a short time! And the fact that The Toasters routed their tour around our festival goes to show that it is truly becoming a world-class international event! My favourite memories almost always involve me performing, or talking to people after they've seen me perform. Each year, the festival continues to provide more memorable moments for each of us who attend. It's always fun to catch up with bands I haven't seen for a long time (like Mustard Plug, who I hadn't seen in several years), to discover new bands I'd never seen nor heard (Westbound Train comes to mind), or to watch our local bands thrive (in the way I've enjoyed watching Danny Rebel & the KGB grow since the first edition). This year, I will be catching up with The Skatalites, with whom I've played several times in Europe, and EST who I was very close with back in the day. DGTS: What is the Montreal ska scene like? Ska is pretty much relegated to the underground in the US--is it fairly popular in Canada right now and does it tend to attract people from other music scenes? LM: Ska as a genre does not have a very "popular" standing at the moment. We've also slipped back into the underground, but that's a great occasion to refresh and regroup and continue to inspire each other. I don't know if ska will ever really explode into popularity and become its own entity the way hip-hop has, or metal. I think people don't really know what it is, and that it has SUCH a varied offering that it doesn't actually fit into one category anyway. Ska-punk fits into the category of punk, ska-pop fits into pop, and so on. There are a few bands that can play major festivals and make a living at the music, but to say "few" is even being generous. We're lucky enough to have a healthy underground, and a steady stream of newcomers to the music, and to have a good pool of talent and fans that can allow this music to thrive in our community. DGTS: Which ska bands in Montreal should we make sure to check out? VD: Definitely Danny Rebel & the KGB who were part of the MSF in 2009 and are playing again this year. They are just about to record their second album and this time, they are working with the legendary producer Victor Rice! They are unbelievable performers and write the catchiest songs ever. Make sure you check them out, they will be coming to the US soon! The Fundamentals, The Hangers, The Beatdown, and R.D.C. are all great talented bands from Montreal. LM: I agree that DRKGB are a must-see and the ones to watch. The Fundamentals have also raised the bar on every level, whether it's songwriting or performing. We're very fortunate to have a good variety of ska in the city--something for everyone! DGTS: Can you share with us the origins of your own band, The Fabulous Lolo? Its traditional ska/rocksteady sound is a big shift in direction from the post-2 Tone ska of The Kingpins and Lo and the Magnetics--why did you want to explore this aspect of the genre? LM: If you listen to the evolution of The Kingpins, you will see that what we did was explore a different facet of ska on each album. Each project was approached in a completely different way. We started off very 2 Tone like, then took a step back in time to explore our love of the 60s garage-twist-movie soundtrack sound, and followed that up with a wonderful testament to our take on traditional "old-school" Jamaican ska and rocksteady. The last Kingpins album, and the Magnetics album were both a study of more modern sounds, incorporating a lot more technology, so these were not influential in the birth of The Fabulous LoLo. This exploration of different eras of ska (starting in 1996-1997) was spearheaded by our then keyboard player Ian "Hot Tub" Hodkinson, and when he left the band, Jesse Radz (trumpet) kept us on the path towards traditional sounds. We willingly and eagerly discovered so many wonderful songs and artists from that time and this gave rise to the Stomp All-Stars in 1997 or 1998 when, over a few beers, Bobby Beaton (Kingpins, guitar) proposed to Matt Collyer (Planet Smashers, guitar) that it would be a great idea to do some sort of all-star band and play some of those great old tunes together instead of always performing our own tunes as separate bands. The pinnacle of that band came in 2000 when we played at the Montreal International Jazz Festival on one of the outdoor stages. We had programmed the entire ska series (led by John Jordan as our link between the festival organizers and our band suggestions, which were all selected). In late 2005, the Magnetics were not very busy (and in fact, were about to go on hiatus in May 2006). I had no other regular band to speak of and I really wanted to do something. I decided to contact the Jazz Festival organizers myself after having performed several times with The Kingpins and propose the idea of getting an all-star band together but concentrating on rocksteady music. They loved the idea and in Spring 2006 they confirmed they would love to invite us to participate at that summer's festival! (The name came from my long-time collaborator Mitch Gírio who said that would be a great stage name.) I was thrilled and immediately sought out the best musicians I could think of for this music! I really approached that first gig as a "meeting of worlds." The idea was to get people from different (in some cases allegedly "opposing") universes together, united in one common goal--black/white, younger/older, old-school/new-school. I got a friend who had played at Studio One in the 60s (Errol Walters) and I got Lynn Taitt who was "the man" at Duke Reid's Treasure Isle, the other prominent studio in Jamaica at the time. I got a Planet Smasher alongside a Kingpin, and I used my very own wonderful musicians from The Kingpins/Magnetics as the core. The full name we gave that first concert was "The Fabulous LoLo sings Rocksteady". DGTS: Before he passed, the band collaborated with the great rocksteady guitarist Lynn Taitt--what transpired and what was it like to work with him? LM: When The Kingpins were recording Let's Go To Work in 1997, we thought it would be wonderful to have one of the "old-timers" on the album to really bring home the trad flavour we were going for. We knew that many Jamaicans from that era had moved up to Canada, mostly Toronto. Our bassist Jordan Swift learned that guitarist Lynn Taitt was actually living not too far from Montreal and we called upon him. I knew nothing of him at the time. I'd never heard his name and didn't know who he was. I was just excited we were having someone who was "there" joining us on the album. He showed up at the studio with his wife and listened to the tunes we wanted to do with him. He was shy and didn't say too much, but once he started opening up, he told us that in fact, he had produced and played on the very first recorded version of the song "Last Train to Expo '67" (which we were asking him to play on!!) Well, that blew our minds. He also played on our original tune "Johnny Rocksteady" by adding some of his signature bubbling guitar. We kept in touch, as he seemed to genuinely get a kick out of playing with us, and it was like watching him rediscover an old love. He'd been doing arranging of different music until then and hadn't been playing much rocksteady, to be sure! He came out and played with the Stomp All Stars in early 1998, and he called me into his studio to do some back vocals and horn section parts on his projects. He had a clear picture of what he wanted and though communication was sometimes hard (expressions and terminologies not always the same), I really enjoyed my moments with him. It was such an honour to have him play with us in 2006. This was his last live performance before he passed away last year. I got to see him a few times in the last year and was very proud for him when he was honoured at the "Legends of Rocksteady" concert at the Jazz Festival in 2009. DGTS: Do you have any plans to bring The Fabulous Lolo down to the US (NYC perhaps?) this year to promote your new album? LM: I would absolutely LOVE to get the band on the road, but you must be painfully aware of how difficult it is to break even with such an expensive undertaking (getting a 10-piece band into a large enough vehicle, feeding them and compensating them). If anyone has any ideas of a mini-tour that is feasible, I am more than open to the idea. DGTS: If you could only save five of your ska/reggae records or CDs from a fire in your home, which ones would they be? LM: I'm glad I live in the age of portable music and this isn't really a question I need worry about! But if it were a consideration, for NOSTALGIC reasons (not because I listen to them regularly), I would save my vinyl editions of This Are 2 Tone and Dance Craze. These albums were the first ska albums I bought! I would then make sure I had my Fabulous LoLo CD because it was a very proud moment to finally get this 10-piece band down on a proper recording! And I would be crazy to leave behind an absolute collector's item, The Kingpins' On the Run EP from 1995. That is irreplaceable. Last but not least, an album I actually do listen to on occasion Danny Rebel & the KGB's Soul Shaker. I wouldn't feel bad about the rest of my collection, but these ones I would miss! Actually, now you have me thinking about other items that are precious and irreplaceable! Last Saturday night (10/1/11), as the weird-ish mix of ska fans (skins, rudies, a few punks) and Brooklyn indie-nerd-rock hipsters milled about on the dance floor of The Bell House waiting for the Stranger Cole and Patsy show to begin, you could already sense that it was going to be an extraordinary night. Everyone was in an euphoric mood (you certainly can't always say that about all shows in NYC)--we knew we were going to witness/experience something truly phenomenal (in the truest sense of that word) that none of us had ever expected to happen in our lifetimes. It was like somehow we had collectively found a way to temporarily suspend the laws of time and space which allowed these few hours of musical bliss to happen. While Stranger Cole has been actively touring recently, apparently he hasn't played NYC in about a decade. Patsy (aka Millicent Todd), who retired from the music business in the late 1960s, hasn't performed in the US since that decade (according to the Jamaica Gleaner, she played here with Byron Lee and The Dragonaires) and has never appeared in NYC on stage with Stranger Cole. While she currently resides in Florida, she spend most of her life living in Brooklyn and working as a secretary at Lenox Hill Hospital on the East Side of Manhattan (which is about 13 blocks from where I live). According to the Dig Deeper promoters, it took about four years of persuading, pleading, and negotiating to set this show up--and based on the singers' performances and the audience's reaction, it was time very well spent. The all-star Crazy Baldhead band--led by Agent Jay of The Slackers and Reggay Lords on guitar; Dan Jeselsohn (Rocksteady 7, ex-Skinnerbox) on bass; Phil Wartell (Reggay Lords, ex-Stubborn All-Stars) on drums; Vic Ruggiero (The Slackers) on keys; Dave Hillyard (The Slackers, Rocksteady 7) on sax; Buford O'Sullivan (Easy Stars All-Stars, ex-Scofflaws, ex-Toasters) on t-bone; and Larry McDonald (The Wailers, The Dragonaires, Dub is a Weapon) on percussion--prepped the crowd with a few instrumental ska classics. With all the focus on Stranger and Patsy, it would be easy to overlook just how fantastic the Crazy Baldhead band was throughout the evening. The arrangements of all of these well-known and treasured classics were outstanding--crisp and vibrant--and their backing of both singers wasn't showy or obtrusive, but created the perfect musical setting to let these two legends do their thing and shine. Stranger Cole hit the stage first to perform many of his biggest hits, including "Koo Koo Doo," "Just Like a River," "Crying Every Night" (which was stellar), and "Rough and Tough" (all captured in the videos I shot below). Cole's manic energy, crazy herky-jerky dancing, skinny frame, and constant exhortations to the crowd of "More life!" (he kept noting rightly that, "without life we have nothing!") made one well-known NYC ska musician to turn to me and say (with all love and respect) that he's "the Don Knotts of ska." Cole was a supremely entertaining and electrifying performer--and was clearly have the time of his life on stage in front of his demonstrably appreciative fans. Patsy, looking and sounding magnificent, then took the spotlight with "Fire in Your Wire" (captured below), as well as "It's So Hard Without You," and "Pata Pata Rocksteady" (also on video). Of the two performers, she is clearly the more reserved--but this plays so well off Cole's unrestrained enthusiasm. Finally, we were treated to a string of Stranger and Patsy's greatest hits together: "Tonight," "Give Me the Right," "Down the Train Line" (which I've heard The Bluebeats play so many times--this one was for you, Mike Drance! ), "Yeah Yeah Baby," and "When I Call Your Name." There were other songs, too, which I didn't film or write down--I had to put the camera down and dance a bit, too, you know--but all of the videos below will give you a really good sense of what incredible things transpired this night. All in all, it was a triumph for all of the performers involved and an incredible gift to all of us fortunate enough to be in the audience.